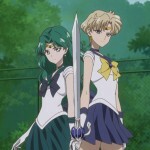 This entry was posted in Pretty Guardian Sailor Moon Crystal (2014), Voice Actors and tagged Sailor Moon Crystal Act 27 - Infinity 1 - Premonition - First Part, Sailor Moon Crystal English Dub, Sailor Moon Crystal Phase 3 - Infinity, Sailor Neptune, Sailor Uranus by Adam. Bookmark the permalink. I love the new voices, but I always find it funny how I think they fit better so much better in Crystal than the original. Not sure why I feel like that, but every time I see them in Crystal, I feel like they fit better. I agree. I ask you, do you think it’s because of the tone of the original anime versus Crystal? Or the juxtoposition between old video quality and the new voice recordings? Mostly the tone. But maybe a little of both. I think the Japanese and even some of the original English dub actors brought a lot of character to Sailor Moon while the Viz dub doesn’t do that for me. Often I cannot tell one girl’s voice from another (with the exception of Jupiter) and there is a lot of monotone, at least in my opinion. In Crystal this seems to work. I recently saw a review on Youtube of the 1996 Viz dub of the Galaxy Express 999 movie that had some strangely familiar complaints about flat and emotionless voice acting. Looking at the cast of that dub, it seems to have mostly been the same crew of actors that voiced ReBoot, Transformers: Beast Wars, and Shadow Raiders – none of which seemed to have suffered noticable from such things. Is flat voice direction somehow part of Viz’s corpoarate DNA going back more than 20 years? The Ocean Group out of Vancouver did a lot of dubbing back in the day. I remember that dub! I believe you are right, a lot of these actors have more range in other dubs. It seems to be a Viz thing as far as Sailor Moon goes at least, and with the other evidence you shared, makes me think it is recurring. Glad you finally found the clip. Now when do these episodes hit Hulu? That’s what I want to know! Wonder if this clip will trigger another “art style war” (Seasons 1-2 vs. 3) in a forum I attend. December 5 can’t come soon enough! I look forward to this release after a long time of waiting. I also hope we get more information about the Dream Arc. Too cool! In Arthur C. Clarke’s Space Odyssey novels he suggests that there is a diamond at the core of Jupiter. I think that’s in 2010 but perhaps it was 2061. In 3001 I believe they suggest the space elevators and orbital ring are made out of it! Guys, I just learned about the hurricane: are you American people of Sailor Moon News safe? 1. 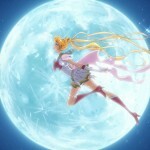 I wonder when the 2 films of Sailor Moon Crystal will be released? 2. When will Sailor Moon Super S be released? 3. 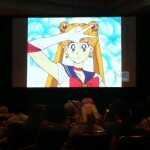 In one of the films, I hope Usagi and her friends will be in bikinis. Wow, replying to a questiona about whether people are safe after a disaster with talking about wanting to see animated characters in swim suits? Totally inappropriate. Ammmm nobody asked you buddy, world has bigger problems than sailor moon and sailor moon crystal right now. A pen pal of mine lives within relative range, but she’s okay. Still, really crappy. I feel for the victims and affected. Thank you Joseph! Actually my last message was for Luke and Justme whose answers were totally inappropriate. I’m glad that you pen pal is okay and hope she will stay safe. Oh, I understood. I wanted to express my condolences as well. Ok, I’m relieved then . I was concerned my message looked like an injonction while it was, in fact, an ironic answer to our two fellow mates. Nah, we’re cool! 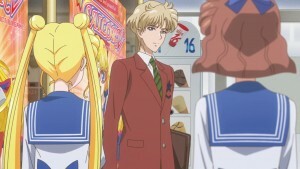 You’re the first user I think about whenever I get into a new batch of SailorMoonNews.com discussion. Can’t say I know who that posts here is from the affected areas. I’m quite far away from it myself. Let’s all say prayers and/or send good thoughts to Texas right now. *smacks Luke for smacking me so many times* Bikinis can wait. I live in Florida but I feel extremely hurt and saddened by the hurricane and the people affected in Texas and nearby areas. I feel even more terrible about the abandoned dogs in the area. Some owners clearly should not own pets. 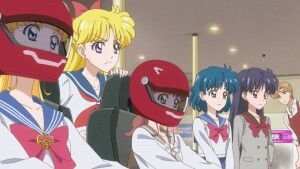 Isn’t Usagi Tsukino too young to try race car driving on real life race car tracks? She was still a junior high school student in the Death Busters story arc. 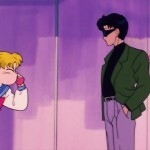 Perhaps Haruka Tenoh shouldn’t have suggested that Usagi visit the race car tracks. Gotta be less dangerous than fighting monsters!! !